Enid’s premier personal training/yoga/Pilates studio. Wherever you are on your exercise adventure, our enthusiastic and well-trained professionals will guide you from determining your Polar BodyAge and creating a personal cardio prescription to fulfilling your fitness potential. 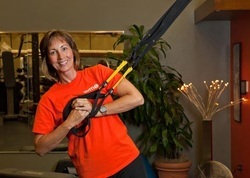 You will love our state-of-the-art equipment and our team approach to your health. Are you seeking more energy, better strength, increased flexibility or trying to lose weight? Are you recovering from an injury or training for your next competitive event? GYM is the place for you. GYM offers yoga and pilates classes. Assessments include a personal profile: blood pressure, VO2 max, height, weight, body fat, lean mass, girth measurements, strength and flexibility protocols, basal metabolic rate, nutrition assessment, meal planner and goal setting.